Placed comfortably as the company’s top mid-range model, the LG Optimus L9 is a droid that should be on your check list when shopping for a stylish smartphone offering great bang for your buck. It’s now time to check how it does in our traditional battery test and how it stacks up against its direct rivals. Naturally we put the LG Optimus L9′s battery through its paces in our traditional battery test to see how far it can take you in everyday situations. Harvesting the power of the same 2150mAh battery found in the Optimus 4X HD, the LG Optimus L9 was expected to easily better the endurance of its high-end sibling, considering it’s got half the CPU cores and far fewer pixels to feed. 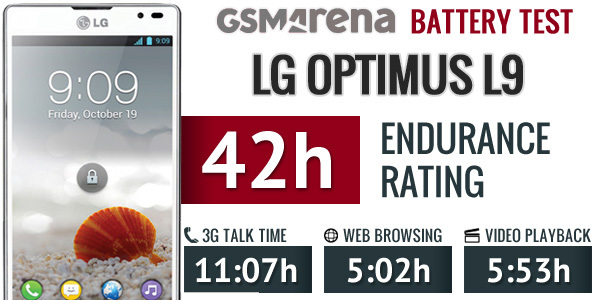 Starting off with the talk time test, the Optimus L9 managed to achieve a respectable time of 11 hours and 7 minutes – a substantial improvement over the 4X HD’s time of 7 hours and 41 minutes. Pretty surprising considering that neither the chipset nor the display matter here, but obviously the L9 also has a pretty efficient modem, too. When it comes to web browsing, the LG Optimus L9 managed to endure 5 hours and 2 minutes – not the most impressive of times we have seen but still better than the 4X HD. The video playback time of the LG Optimus L9 came slightly disappointing at 5 hours and 53 minutes. That’s only enough to secure the L9 a spot in the bottom third of our chart and we certainly expected it to do better here. 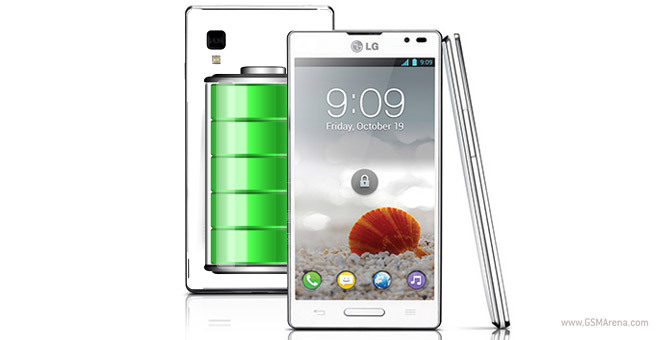 The LG Optimus L9 finished out battery test with an endurance rating of 42 hours. This means you’ll have to charge the smartphone every 42 hours if you do an hour each of talking, browsing and watching videos per day. If you do more talking and less of the other two activities you might be getting an even longer power autonomy, but video fans will probably have to charge it daily. We’re all but certain that the Optimus L9 can get an even better score if it gets updated to Android 4.1 Jelly Bean, which as we have seen in the past improves web browser efficiency significantly.